This review assesses the effectiveness of a product called GNC Mega Men Prostate And Virility. This product is a dietary supplement that is designed for daily use, and its purpose is to support the health of the prostate gland. We take a look at the ingredients inside the product to determine how effective it is and we have a look at what customer service the manufacturer offers. One of the causes of hyperplasia (cell overgrowth) in the body is cells which are unhealthy. This is because the body tries to produce more cells when it realises that the organ is not conducting its function properly. The prostate is no exception. In the prostate, unhealthy cells are also more susceptible to genetic damage which is a contributor to prostate enlargement. 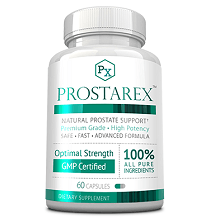 The vitamins and minerals in this product therefore help to maintain the normal functioning of prostate cells to remove this cause of the hyperplasia. The other ingredients then have supporting effects. For example, saw palmetto has been shown to be an effective antiproliferative compound- meaning that it reduces the division of cells, which is what causes hyperplasia. Lycopene has also been shown to be an effective antioxidant that reduces the chance of developing prostate enlargement and prostate cancer. Two capsules of GNC Mega Men Prostate And Virility must be taken daily with food. Most of the vitamins and minerals in the supplement are at levels of 100% or over the daily value determined for a healthy diet. No specific side effects have been noted with the use of this product, but the manufacturer suggests that anyone with a medical condition, especially one for which they take chronic medication, should speak to a doctor before using this supplement. GNC Mega Men Prostate And Virility should also be discontinued two weeks before any surgery. A package of 90 capsules can be bought online for $24.99. This price does not include shipping and taxes. The manufacturer offers free shipping on all purchases over $49 and a 10% discount when customers subscribe for a repeat order. 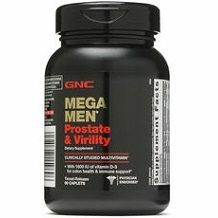 GNC Mega Men Prostate And Virility may be returned within 30 days from the order date for a full refund if the customer is not happy for some reason. The manufacturer explicitly states that the guarantee covers used or unused products. The natural ingredients in this product are quite well considered and are backed by scientific research. The price of GNC Mega Men Prostate And Virility is also very reasonable. This manufacturer also has some features of a product with good customer support- like a discount for subscription and a guarantee. The problem with these features is that they are somewhat insignificant because the discount is not very much compared to what some other manufacturers offer and the guarantee is not long enough to test the product sufficiently.